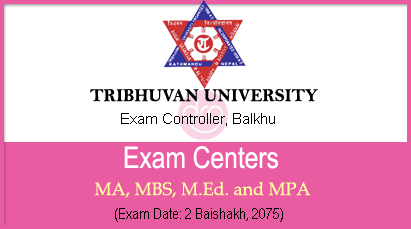 Today, 29 Chaitra, 2074 [12 April, 2018], Tribhuvan University [TU], Office of Controller of Examination, Balkhu has published Exam Centers for the Masters Level Examination of Humanities, Management, Education and Public Administration faculty (MA, MBS, M.Ed and MPA) in both regular and partial side for Kathmandu and Kavrepalanchowk district. 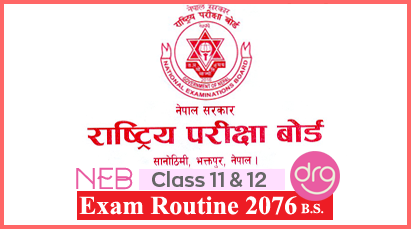 The Examination is going to be held on 02 Baisakh, 2075 [15 April, 2018]. Note: For Clear View - Just Right Click On Image and Click On "Open Link In New Tab" Or "Open Link In New Window". And then Zoom it. 0 Response to "Exam Centers For Masters Level First Year MA, MBS, M.Ed. and MPA | 2075 | TU"